Gardening is a passion of mine and I love sharing tips and tricks with you guys that I’ve learned over the years. If you’re new to gardening then it can all seem overwhelming and intimidating at first. It’s pretty easy once you get into it though. Check the USDA Plant Hardiness Zone Map to determine your first and last frost dates. These dates will be used to calculate when to plant in your area. 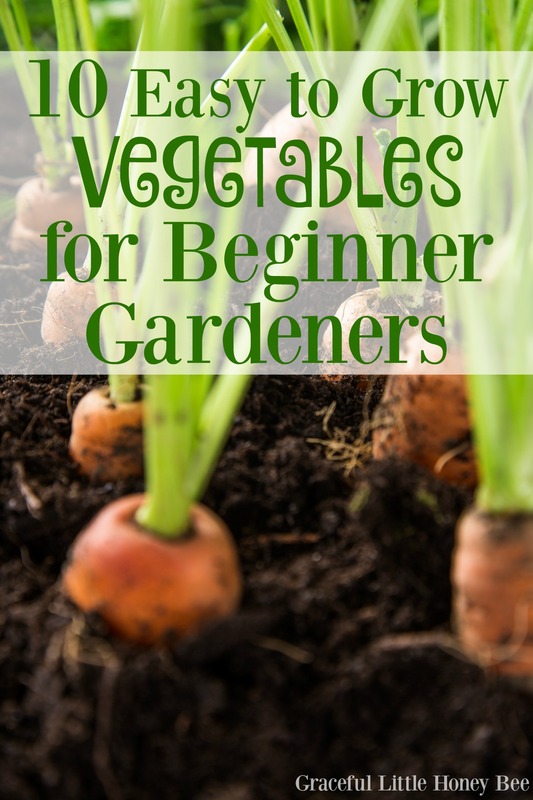 Some things are easier to grow than others which is why I’ve compiled this list of 10 Easy Vegetables to Grow in the Backyard Garden. Enjoy and I’d love to hear about your gardening adventures in the comment section below! I’ve never had a problem growing green beans. You can grow either a bush bean or a pole bean. If you choose the pole bean then you will need to have a trellis that it can grow up. I prefer the pole bean because it can be kind of hard hunting for beans all over the ground with the bush varieties. Seeds should be planted in the ground after the danger of frost has past. Most varieties take 50-70 days until harvest. Cucumbers are another really easy crop to grow. They’re pretty prolific so unless you plan on canning or preserving them 3-4 plants should be plenty for fresh eating. They are a vine as well so you will need to trellis them. Seeds should be planted in the ground after the danger of frost has past. Most varieties take 50-60 days until harvest. If you have any friends who garden then you’ve probably received a load of free zucchini from them. This is because they are REALLY prolific and grow like crazy. All squash are susceptible to powdery mildew and squash bugs so be sure to check your plants regularly after they start setting fruit. Seeds should be planted in the ground after the danger of frost has past. Most varieties take 50-60 days until harvest. Also, be sure to space them out according to package directions or they will take over your whole garden. Ask me how I know. Radishes are a fast growing cold weather crop that should be planted 4-6 weeks before your average frost date. Succession plant (every 2-3 weeks) for a longer harvest period. Most salad varieties take only 30-40 days until harvest. Beets are another cold weather root crop that are easy to grow. Seeds can be planted in early spring (around 4-6 weeks before average first frost) and can also be succession planted for a longer harvest period. Greens are also edible. Most varieties take 50-60 days until harvest. This one is an herb not a vegetable, but I think it should be included in every garden for its amazing flavor and ability to keep pests at bay. If you’re new to gardening then I would suggest buying starts (small plants) at your local nursery and planting outside once all danger of frost has past. Continual harvest keeps plants happy and growing all season long. Carrots are a cold weather root crop that are easy to grow. Make sure your soil is loose so the roots grow straight. Sow seeds on top of soil and lightly cover with dirt 4-6 weeks before average first frost date. You will need to thin seeds once they are about 3″-4″. Most varieties take 60-80 days until harvest. Peas are a cold weather crop that can be planted as soon as the soil can be worked in late winter or very early spring. You want plants to grow and flower before it gets too warm or they won’t produce. Pick pods when they are young and tender. Most varieties take 50-60 days until harvest. Okra is heat loving plant that is also drought tolerant. Seeds can be planted in the ground once night temps reach 55 degrees. You may have to start seeds indoors if you live in a cold climate. Plants flower in the early morning. Pick pods when they are young and tender (usually around 3″-5″ in long). Pods will become too tough to eat once they get too long. Peppers are another heat loving plant. If you’re just starting out then I would suggest buying starts at your local nursery and planting in the ground after all danger of frost has past and night temps reach 55 degrees. I’ve had the most success with jalapeños, banana peppers and cayenne peppers. I’ve found bell peppers to be a little bit more finicky. Seeds can also be started indoors 8-10 weeks before transplanting. What is your favorite vegetable to grow? I’d love to know! Green beans are my favorite to grow. Hands down easiest things ever! I agree they are super easy and prolific! green onions I still have them in the ground and can just run out and grab a couple when I need them they need little to no attention but they taste so good. Great one! Green onions are really hard to kill. :) I normally buy them from the store and then plant them in a pot on my windowsill and cut as needed. They will regrow for a long time that way. The more vegetables, the better! Great post. Tomatoes are my favorite to grow. They love the heat of southern AZ and produce like crazy. The kids love to pick them and to search for tomato worms to feed the chickens! Hi, I am very new to gardening. You mention before first frost often, do you mean last frost? Thank you so much for your help and I'm so excited for the info on this post and can't wait to start planting. The last frost is the average date for the last frost in the Spring for your area and the last frost is the average date for the last frost of the season in the Fall for your area. I think you mean first frost for fall. Last frost comes in the spring. I was confused by your post as well because you would say before the first frost as time to plant. Just needs some rewording. We've planted green beans, peas, potatos, turnips and buttercup squash without a problem but the carrots were a failure. This post got me so excited! In a couple of months I will move to a house with a garden and I can't wait to put into practice all your tips... And as a Vegan you can imagine that the idea of growing lots of veggies makes my heart sing :D May I ask which varieties would be ok to grow in (big) planters? I'm a totally newbie, so I'll be coming back for more :-) thank you! Tomatoes and peppers do well in pots, but they need to be big. I plan on starting a small raised bed garden against a deck. Should the pole veggies be planted towards the back? Wasn't sure if there was a planting order protocol. Thank you ! You should plant them wherever they have supports to grow and won't block the sunlight from your other plants. Thanks for the advice! We are closing on our first house in April which has a huge spot to garden! I am excited about gardening to grow vegetables, but a little out of my comfort zone. I have always helped plant flowers and things like that for landscaping. Any helpful tips for a budding gardener [pun intended :) ]? I tried green beans seeds that were made for pots and I never even got one. My cucumbers grew like wild. Tomatoes, peppers great. In fact, I brought the pepper plants inside with peppers still on them during the winter and one has new leaves on it already for spring. I don't know what happened to the green beans. The stems and leaves grew. no beans. Recula is super easy to grow. You seed it directly on ground it don’t catch any bug. The flowers are edibles, but if you let them become seed you would have seeds for new planting.